This is the second in a series of posts about losing weight on the bike. Throughout this discussion it’s important to keep in mind that eating has many consequences for health, athletic performance and weight loss. The “best” diet for losing weight is unlikely to be the “best” diet for maintaining either your health or a high level of athletic performance. In the first part of this series, Riding the Bike to Lose Weight, I pointed out that there is a modifying factor that affects the basic relationship between caloric intake and weight loss. The basic relationship is that if you ingest fewer calories than you burn during the course of a day, you will lose weight, if you ingest more than you burn, you will gain weight, and if caloric intake and caloric burn are about equal, your weight will remain stable. The modifying factor is metabolic homeostasis. If you’re not familiar with the jargon, “metabolic homeostasis” is incomprehensible and useless gobbledegook. In the context of thinking about weight loss, “metabolic” refers to the chemical processes that are involved in the breaking down of food in the digestive system and the ways the results of that breakdown process, such as glucose, are used by the body. A homeostatic system is one that acts to keep itself at an equilibrium point or within an equilibrium range. A common example is the climate control system in your house or car. You set the thermostat for a high and a low temperature and the climate control system keeps the temperature of your house or car within this range. If it gets too hot, the air conditioning is turned on; if it gets too cold, the heat comes on. The human body is a brilliant homeostatic system in a number of ways. If the core temperature of the body gets too hot, you sweat to rid yourself of excess heat; if core temperature gets too cold, you shiver to generate more heat. If blood glucose drops too low, the system reduces glucose uptake at the muscles to maintain glucose supply to the brain. Cyclists in the heat of battle sometimes wish it didn’t work this way as they go into a bonk and their legs shut down. 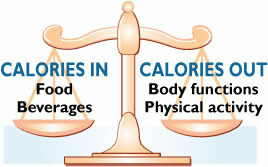 Metabolic homeostasis refers to the body’s mechanisms for maintaining a balance between caloric intake and caloric burn. This homeostatic system is more complicated than previously thought and much about it is currently not well understood. I’ll try to summarize some of the issues that come into play when considering weight loss, exercise and metabolic homeostasis. One thing that appears to be soundly supported by the available evidence is that the body adapts to a regular, sustained change in the relationship between caloric intake and caloric burn by reducing the number of calories needed to fuel the same amount of activity. Here’s an example of how this works. Suppose your caloric intake and burn are balanced; on a typical day your regular activities burned 2000 kilocalories and you ingested about 2000 kilocalories in food during the day. Your weight would remain stable. Then you go on a diet and ingest only 1800 kilocalories a day. At first you would lose weight because the 1800 kilocalories you ingest is less than the 2000 kilocalories you burn each day. However, if you stayed on this 1800 kilocalorie per day diet for a period of time, your body would adapt to that reduced caloric intake by enabling you to engage in the same activity you were doing every day before you began the diet while only burning 1800 kilocalories. Once that happens caloric intake and caloric burn are balanced again and you stop losing weight. A slightly more technical way to express this idea is that the basal metabolic rate will change to maintain metabolic homeostasis. Roughly speaking, basal metabolic rate is the rate at which kilocalories are burned to support normal daily activity. When the balance between caloric intake and burn is disrupted through dieting or exercise weight is initially lost because fewer kilocalories are ingested than are burned and the basal metabolic rate has not yet adapted to the change. 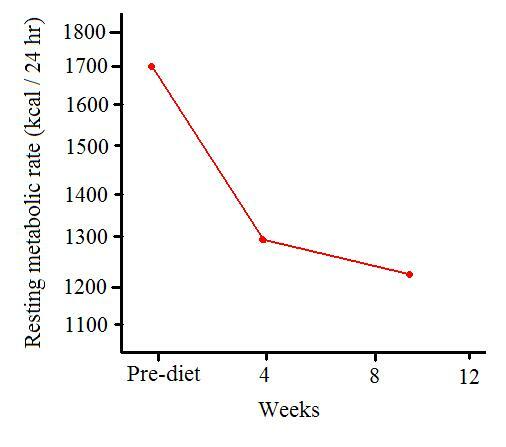 However, after a period of sustained dieting or exercise the basal metabolic rate adjusts to the reduction in kilocalories ingested (by dieting) or the increase in kilocalories burned (by exercise), a balance between caloric intake and burn is once again achieved, and weight loss stops. Maintaining metabolic homeostasis through a reduction in basal metabolic rate means that there’s only so far you can go when trying to lose weight by dieting, exercise or both. If you want to keep losing weight through dieting, you have to continue reducing the number of kilocalories you ingest every day. If you want to continue losing weight through exercise such as riding the bike, you have to keep increasing the intensity of the exercise. This is why it was recommended in Riding the Bike to Lose Weight that you continually try to ride harder, longer, faster, stronger every time out on the bike if you want to lose weight. If the intensity of the exercise remains the same, basal metabolic rate will adapt to it and weight loss will stop. If the intensity keeps increasing, basal metabolic rate will lag behind and weight loss can continue. If this were the whole story about metabolic homeostasis it would be simple. If you enjoy riding the bike, figure out ways to put more time and energy into riding the bike and forget about worrying about calories and weight loss. You will be doing something you enjoy, you will be thinking about something you enjoy and you will most likely lose weight. The hope is that when you get to the point where you are putting all the time and energy you can or want to into the bike, your weight will have dropped to a level you like. Unfortunately, it’s not this simple. Riding the bike (or any other form of exercise) makes you hungry, makes you want to eat more. In addition, men and women are affected differently by this increase in the desire to eat after exercise. More on this in the next post in the series. This entry was posted in Uncategorized by Kevin Murnane. Bookmark the permalink.